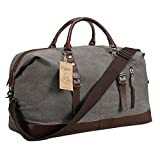 Duffel bags are usually made of high-quality materials and a must-have for people that travel often. Having a great travel duffel bag makes the traveling experience a lot easier and enjoyable with every item in a single bag. Duffel bags are quite durable and can serve you for years to come. 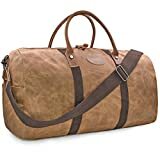 The popularity of duffel bags on the market has led to a rise in numbers and designs with manufacturers looking to get a pie of the market share. However, this does not mean you buy any duffel bag. This review will look at some of the best duffel bags on the market for you to buy. These are the most rated, reviewed and recommended across many consumer sites. Read on and choose yourself a duffel bag that best suits your traveling needs. Our first pick on the list is the Samsonite which is a quality duffel bag made of 100% nylon. It is a durable bag that can serve you well for years withstanding the numerous weather elements outside. This bag is waterproof and best placed to protect your items. Measuring 17 inches wide and 11.5inches high, the bag is large enough to fit many items. It is an excellent with zippered compartments to create additional storage space for small items. Maintenance is quite easy with a simple hand wash.
Newhey is genuine leather travel duffel with high-density canvas and superior cowhide crazy horse leather. It is a durable choice that will last you for ages with a high-density canvas that does not rip or tear. The large main compartment is oversize and capable of holding most of your items with ease. Various inner pockets are ideal for small items. It is a comfortable and easy to use the bag with rounded handles that make it easy to carry. Overall, it is a suitable option for a weekend or 3-4 days. You can easily close it with the zippers and two magnetic button pockets. This is a large capacity duffel bag measuring 24” by14” by 9” and a durable choice for your travel needs. The bag is waterproof and wears resistant. It is made of the durable honeycomb 210D nylon fabric. It is also lightweight and only weighs 1.2 pounds. You can easily fold the bag into a compact unit to take up very little space when you just want to carry it. 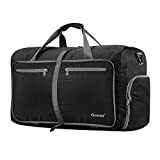 Bag packing cubes of this duffel bag enable you to be organized. Overall, it is a multipurpose bag that can be used for traveling, visiting the gym, overnight, sports event and many more. The Shacke’s measures 19.5” by 9” by13.5” giving you a large main compartment to store most of your items with ease. There are a further four extra compartments for the shoe, side elastic pouch, front zipper compartment and an inner hanging pouch. The double zippers for this duffel bag are TSA locks. An adjustable shoulder strap ensures the bag perfectly fit people of all sizes. It is super light and comes with a water-resistant inner lining to protect your items in case of water or rain. A further Velcro trolley straps transform your duffel into a luggage trolley. This is a cylinder duffel with dual zippers to allow for easy opening and closing. It is a durable pick made of canvas with durable inner pouches to carry more items. The front of this bag has a hidden zipper that can be used to carry daily necessities and giving you easy access. Computer bags inside further help protect your computer when traveling. Overall, this is a multipurpose bag that can be used as a handbag, shoulder bag, backpack, and satchel. It is a perfect choice for outdoor activities. 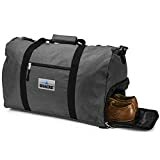 This is another top-notch duffel bag with great reviews online, and a must check out if you need a quality travel bag. It is hand washable and has a cotton lining inside to have your items in a soft and smooth place. It is large 25 centimeters wide and made of the high-quality canvas material. The bag has several large and small compartments to store as many items as possible. The shoulder strap is removable and adjustable to suit your height. It also has a handle with a Velcro strap for a good grip. Suvom is a large duffle bag registered in the USA and an ideal option for a weekend or a trip off town for a few days. It is a versatile bag that works well for both men and women. It is made of 100% cotton canvas and genuine crazy horse leather. The bag feels comfortable when worn and remains heat resistant protecting your items. The top handle is real leather and quite easy to carry. It features two large quality zippers, snaps buckles, strong hardware, adjustable and removable shoulder straps. There are also multiple pockets on the sides for extra room. This is a colorful duffel bag made in China and an ideal choice for men and women. It is a pretty versatile bag that can be folded for easy storage and use. It is anti-wrinkle and folding will not affect it. The unique printing floral pattern looks beautiful. It is large and meets airline carry regulations making it a must-have for flight travels. The large shoulder strap and handle allows for easy transfer from shoulder to hands. The shoulder strap can easily be detached with ease. Bago is our top pick this year with a wide array of features. 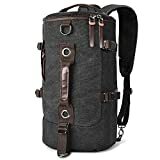 It is a top quality bag for both men and women. The bag can be used for various uses like travel, shopping, storing sports gear, overnight and a lot more. It is durable and lightweight. The honeycomb Ripstop material used to make the bag is durable and resists wear and tear. You can be sure of getting good value for your money using this bag. It is a compact duffle that can be folded and stored with ease. Make your weekend travel a lot easier by getting one of these amazing travel duffel bags. These are the best picks on the market and best placed to offer you good value for money.